Draining pasta noodles, washing vegetables, rinsing rice and grains, even using in conjunction with cheesecloth to strain yogurt or stock… a colander is indispensable in a well-equipped kitchen. With different features and materials to choose from, here's what you need to know about buying the best colanders for your needs, and ways that you can make the most of your purchase. Here's what you need to know about the various types of colanders available, and which might be best for your needs. Fine mesh colanders are good for rinsing or draining small-grained foods, such as rice, quinoa, or orzo. They're also good for straining solids out of stock or particles out of a liquid, but they can be difficult to clean since the mesh is so fine. Plastic colanders are lightweight and inexpensive, but if they come in contact with a hot pot or pan, they can melt. The holes in plastic colanders are also larger and sometimes widely spaced, so liquids won't drain out as quickly. Enameled or powder-coated metal colanders usually come in pretty colors, and some even have holes punched out in decorative patterns, but they can be slow to drain. 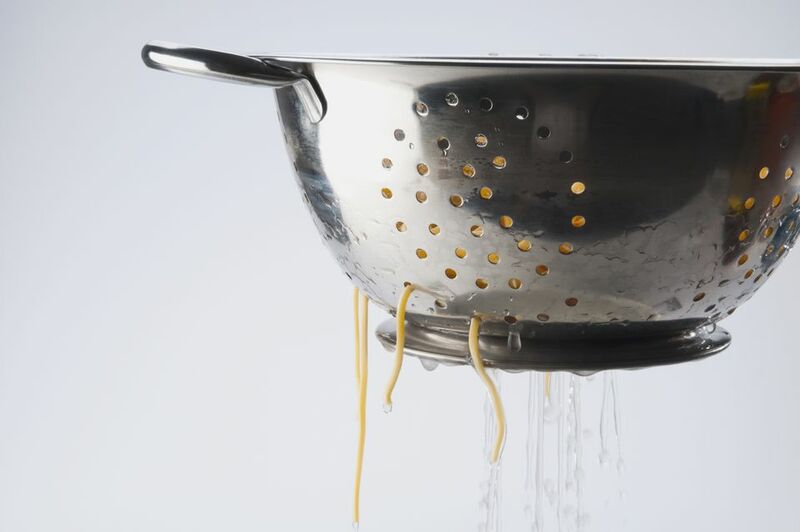 If you choose a metal colander, make sure that there are plenty of holes, particularly in and near the base. Look for colanders with feet that will hold the base of the colander an inch or two above the bottom of your sink, so that the water will drain away easily. Another option is a colander with extendable arms that will hold it suspended over your sink. If you only get one colander, get one that's roughly the size of the pot in which you boil pasta or potatoes, so that you know that its contents will fit. It's also helpful to have a small mesh colander (with a 4- to 5-inch diameter) that you can use for small tasks like rinsing a few berries, straining a can of beans or even as a stand-in to catch loose tea leaves as you pour yourself a cup of tea. If space is an issue, consider a collapsible colander, which is made of all silicone or with silicone panels to allow it to flatten considerably for storage. Silicone has the added benefit of being heat-safe and stick-resistant. A chinois, or a conical strainer, is the haute-cuisine sister to the colander. It's the tool that classically trained French chefs to use to strain the solids out of their stock. They're also ideal for straining cream sauces or custards to ensure a smooth consistency without a single lump. Berry keeper: Rinse berries, and then store them in the refrigerator, sitting in the colander and suspended over a bowl or resting on a plate. This will allow air to circulate around the fruit and will help prevent the berries from molding. Make Greek-style yogurt or yogurt cheese: Line a colander with damp cheesecloth, place it over a bowl, and spoon plain yogurt onto the cheesecloth. Allow to drain, refrigerated, for 30 minutes to an hour to make thicker, Greek-style yogurt, or for several hours or overnight to make yogurt cheese, which is a tangy, spreadable cheese similar to cream cheese. Use as a bug shield: At an outdoor meal, overturn a large colander over a plate of food to keep the flies away until you're ready to eat. Make a kitchen herb garden. For a metal colander you no longer use, or a vintage colander found at a yard sale or thrift shop, line the colander with a layer of moss, then fill with dirt and plant a few culinary herbs like thyme, parsley, mint or basil. Place on a sunny windowsill and water frequently. Make an ad hock salad spinner. Nest the colander inside of a mixing bowl and add lettuce or greens. Fill with cool water until the greens are submerged. Swish the greens around in the water, then lift the colander out of the colander. Place a plate or a towel over the top of the colander, holding it taught against the handles, and shake the colander over the sink to shake excess water off the greens.